Learn from the best! 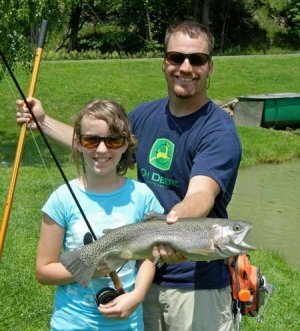 Josh Hedrick, Smoke Hole Outfitter owner and guide, will teach you everything there is to know about fly fishing. Beginners and seasoned anglers alike will benefit from these professional instructions that cover everything from setting up your fly rod, fly casting techniques, essential knots, proper fly selection, how to read water and currents, casting placement, and how to safely release fish. You’ll end the lesson by catching some beautiful trout all on your own with the skills you just learned. Choose from the Beginner Package or the Extended Day Package. Call Josh to make your appointment! Learn the basics from tying knots to choosing flies and casting placement, followed up with catch ‘n release fishing. For a thorough, in-depth lesson from beginning to end on fly fishing, followed up with catch ‘n release fishing. Do I need to have my own fly rod? If you do not have one with you or have not purchased one yet, we will supply one for you to use for the lesson. Can my spouse/friend/child take a lesson with me? Sure! We can teach one person, or a group of anglers. If you have a group, advanced notice is appreciated so we can schedule additional instructors. Group discounts may apply.